WASHINGTON? The heads of the U.S. and Australian defense departments on Nov. 8signed apact in Melbourne to cooperate on space situational awarenessactivities, whichmay include placing U.S. radars in Australia to track satellites anddebris inlow Earth orbit. U.S.Secretary of Defense Robert Gates and Australian Minister of DefenceStephenSmith signed a statement of principles that says the two governmentswill"work together in the spirit of cooperation on the spacesituational awareness partnership for the mutual benefit ofour countries'national security." Thedocument was posted on the Australian Ministry of Defence website. TheUnited States operates a worldwide network of ground radars and opticaltelescopes for tracking objects in space, though its ability to trackobjectsorbiting over the Southern hemisphere is quite limited. The primaryU.S. systemfor tracking objects in low-Earth orbit is the Air Force SpaceSurveillance System ? known as the Space Fence ? whichcomprises three VeryHigh Frequency radar transmission sites and six receive sites spreadacross thesouthern United States. TheAir Force stopped funding Northrop Grumman?s contract in February, andLockheedMartin and Raytheon recently completed their respective system designreviewsand have submitted cost estimates for building the new system. OnOct. 20, the Air Force issued a request for proposals for the nextphase of theprogram, for which it will issue up to two 18-month contracts worth$107million each to continue Space Fence development through preliminarydesignreview. When this phase is complete in 2012, the service plans tochoose oneprime contractor to build the system. Theentire system is expected to cost more than $3.5 billion to complete,accordingto an Oct. 27 Air Force press release. Inthe past few years, the lower orbits around Earth have become muchmore congested as the number of spacefaring nations hasincreased. Andevents like the 2009 collision of an Iridium communications satellitewith aRussian satellite have left thousandsof pieces of junk in orbit. Thechanging environment has driven the Air Force to accelerate its plansto ensurethe new Space Fence achieves initial operation capability by September2015,said Scott Spence, Raytheon?s Space Fence program manager. 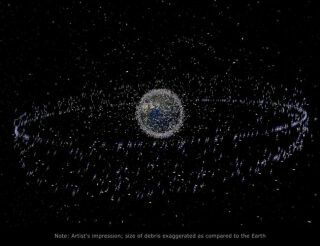 TheAir Force wants the new system to increase the number of objects theSpaceFence can track in low Earth orbit by tenfold, from around 20,000objects todayto upwards of 200,000 objects in the future, Spence said in a Nov. 8interview. Currentplans for the new Space Fence call for the deployment of two or threeradarsites that both transmit and receive signals, said John Morse, LockheedMartin?s Space Fence program director. Whereas the current Space Fenceislocated entirely inside the continental United States, it is likelythat thenext-generation system will be located entirely outside of thecontinentalUnited States, though no firm plans have been announced, Morse said ina Nov. 9interview. ?TheAir Force went through a rigorous analysis of alternatives with regardto[where the sites should be placed],? Morse said. ?They?ve looked atcombinations of sites in a variety of places. They?re really trying togetcoverage in the southern hemisphere.? Inaddition to Australia, the Pentagon is considering placement of siteson theKwajalein Atoll in the Pacific Ocean and Ascension Island in theAtlanticOcean, Air Force spokesman Charles Paone said. TheNov. 8 accord states, "Australia and the United States will investigatethe potential for jointly establishing and operating space situationalawareness facilities in Australia to support the United States spacesurveillance network and to support the development of Australia?sspacesituational awareness and mission assurance capability." Ina Nov. 8 press conference in Melbourne, Gates said further discussionswithAustralia about the placement of Space Fence radar sites are expectedto beginin January. Thisarticle was provided by Space News,dedicated to coveringall aspects of the space industry.